Ever wonder ‘Why do Catholics pray to saints, have statues, or light candles?‘ Get all the explanations for the weird things Catholics do here! It’s been almost a year now since our family made the switch from regularly attending a small non-denominational church that I loved to regularly attending the Catholic Church that my husband’s family has always gone to. I’ve always told my husband that I didn’t care whether we attended a Protestant or Catholic Church–just please not this one. It’s weird. Here, I thought that our differing beliefs were what really separated us. I figured going to Catholic Church would just mean that they switched out the message and the songs for Catholic ones. Boy, was I wrong! 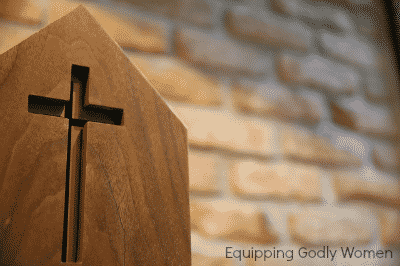 Protestant church is NOTHING like Catholic Mass, and the biggest difference isn’t in the doctrine–it’s in the culture! You see, Catholics have been around a LONG time, so they’ve had a lot of years to think about things… to develop habits and practices and to come up with certain ways of doing things. And unlike Protestant churches, which split and break pretty regularly, Catholic Churches don’t really. Many of the practices that made sense to the Old Testament Jews, the first century Christians, people today, and everyone in between–Well, they’re still around today. So if you’ve ever wondered “Why do Catholics do all the weird things they do” — you’re not alone. Many lifelong Catholics don’t know either. But now you will. 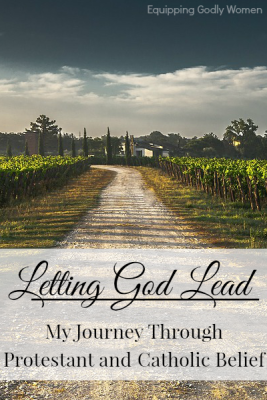 This post is post 11 in a series entitled Letting God Lead: My Journey Through Protestant and Catholic Beliefs. While you certainly can read this post by itself, I highly encourage you to check out the rest of the series as well. Have you ever asked a friend or family member to pray for you? Or asked them to help you out with something you were struggling with spiritually? Catholics do the same thing when they pray to Mary or a Saint. You see, while Protestants typically believe Mary and the Saints aren’t in Heaven yet or are in Heaven but just can’t hear us down here on Earth, Catholics believe Mary and some saints are already in Heaven and can hear us. Catholics still pray to God and Jesus — same as Protestants do. And they still ask their friends and family to pray for them when they are struggling — same as Protestants do. They simply ask Christians who have gone before to pray for them too. For a more thorough explanation on this, be sure to check out my previous post in this series: What do Catholics Really Believe About Mary, Saints and Statues? Catholics pray the rosary because they believe it is very powerful to help them grow in faith, resist evil and get their prayers answered. 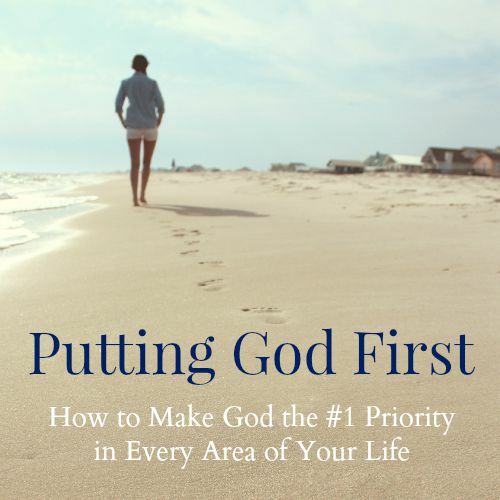 It helps them to focus in order to pray for longer periods of time (Protestant prayers are often very short), and some people can focus better when they hold something in their hands. 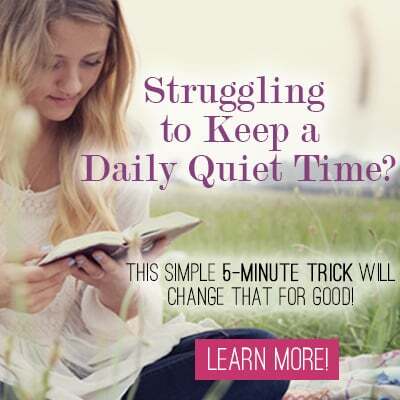 It allows them to really meditate on Christ’s death and resurrection in a way that a quick prayer cannot. A brief history of the rosary: Way back in the 9th century, Irish monks would recite the 150 Psalms as part of their worship. The people living nearby loved this idea, and wanted to do it too, but they couldn’t read and they didn’t have Bibles. As an easier-to-remember alternative, people started to recite 150 “Our Fathers” instead. Pretty soon, people realized that they needed something to help them keep track of what number they were on, and the very first rosaries were created. Tradition has it that the Virgin Mary appeared to Saint Dominic and asked him to spread the love of the rosary throughout the land, but the rosary had already been around for hundreds of years before then. Scholars do believe that Saint Dominic used the rosary in his teachings as a missionary and may have had an influence in the form of the rosary today. 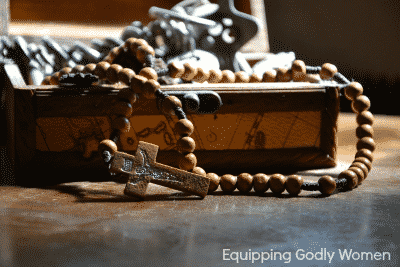 How to pray the rosary: Over the centuries, the way people pray the rosary has morphed significantly. Today, Catholics recite the Apostles’ Creed, the Our Father, the Hail Mary, and the Glory Be all while meditating on various mysteries of faith. You can find detailed instructions on how to pray the rosary here. Why Do Catholics Confess to Priests? For a more thorough explanation, make sure you check out my previous series post: What All Christians Should Know About Priests, the Pope and Confession. Catholics often make the sign of the cross (and say the words “In the name of the Father, and of the Son and of the Holy Spirit”) when they begin and end prayers, when they enter, leave or pass a church and when they receive communion (among other times). This sign is meant to remind them of the Trinity and to be an outward profession of their beliefs and their status as a Catholic. It is done in Eastern Orthodox, high Anglican and high Lutheran churches as well. Why Do Catholics Believe in the Real Presence in the Eucharist? There are several reasons, including the words Jesus used when referring to the Eucharist, the Jewish people’s reactions to Jesus’s words, and the first century church’s beliefs. I cover this question in depth in most post: Is the Eucharist Really Just a Symbol? 5 Convincing Proofs that Say that it’s Not. You should check it out! Holy Water is meant to accomplish three purposes: to signify the believer’s repentance from sin, to be a reminder of their baptism, and to help protect them from evil. Why Don’t Catholics Eat Meat on Fridays During Lent? Because the church says so. Meat isn’t the only thing Catholics give up for Lent though — there are actually a bunch of guidelines as to what Catholics can and cannot eat, which you can read more about this in my post, What Can I Eat During Lent? Your Ultimate Lenten Eating Guide. And before you think that’s too weird, remember: the Jewish people in the Old Testament also had many, many dietary restrictions. Not for their salvation, but because God said it was good for them. So for Catholics to have similar restrictions today really isn’t that unusual. 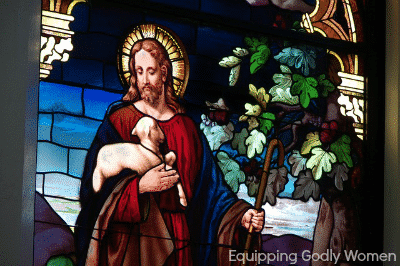 Why Do Catholic Churches Have Statues and Stained Glass Windows? In the early years of Christianity, most people were illiterate. Therefore, the Catholic Church often used visual aids such as statues, the stations of the cross (pictures showing the story of Jesus’s crucifixion), and stained glass windows to help teach the people the story of Jesus since they could not read their Bibles (which they didn’t have) for themselves. Today, the statues simply remind Catholics of the Bible story and inspire them to remember the saints who have gone before. Catholics do not worship these statues any more than Protestants who put up nativity scenes worship theirs. Why Do Catholics Believe We are Saved by Works? The Catholic Church does NOT teach that people are saved by their works. In fact, the catechism of the Catholic Church actually specifically forbids this notion. This Catholic belief is actually 100% Biblical, and is even taught by some highly respected Protestant/non-denominational pastors, including the most Godly man I’ve ever heard speak, Francis Chan. *For a more in-depth look at this topic, please see my other posts Is Faith Alone Enough? and Are You a Christian? Are you Sure? Why Do Catholics Genuflect When Entering and Exiting a Pew? For the same reason that people centuries ago would have bowed briefly when going in front of a king: to show respect. And who deserves respect more than the true King of Kings, who is present in the church? Why Do Catholics Ring Bells During the Eucharistic Prayer? Why Do Catholics Light Candles? Lighting candles is not a formal church teaching, but rather, a very commonly held practice. 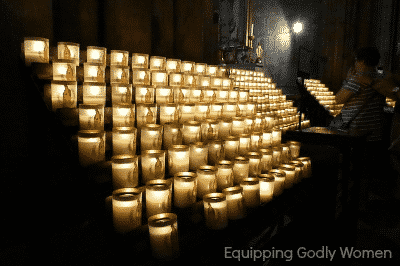 Catholics light candles: to prolong their prayers, to memorialize the dead, to symbolize Jesus, to symbolize the power of light over the darkness, as a form of prayer and to celebrate special occasions. Why Do Catholics Set Aside the Bible for Man-made Traditions? They don’t. Catholics do have plenty of traditions (all churches do), but that doesn’t mean that Catholics just follow traditions and ignore the Bible. Instead, Catholics follow the teachings of Jesus first, and then the teachings of the early apostles second. Some of these teachings were written down in the Bible – but not all. Others were passed down orally throughout the generations. While Protestants don’t follow those traditions anymore (most of them were lost in all the massive church splits), the Catholic Church still does. There’s nothing wrong with traditions themselves — only when they distract from what’s really important. And the churches the Catholic Church follows are meant to bring people closer to God, not take them further away. Why Do Catholics Get Ashes? On Ash Wednesday Catholics often get ashes on their foreheads in the shape of the cross. The practice of putting on ashes dates back to the Old Testament, and Catholics still carry it on to this day. They do so as an outward sign of their sinfulness, their repentance and of their desire to die to this world. 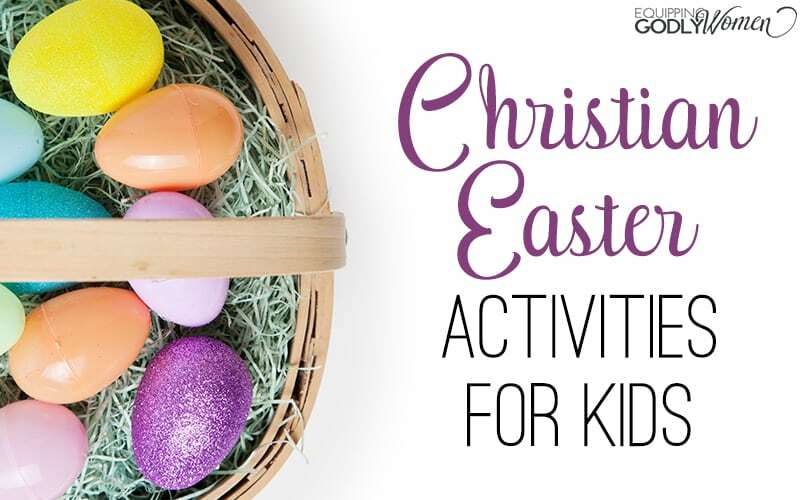 It is also used to commemorate Christ’s death, and as a reminder for Catholics to examine themselves as they enter into the Lenten season. Why Do Catholics Choose a Saint at Confirmation? Choosing a saint at confirmation is optional, but encouraged. Catholics are encouraged to choose a saint who they would look up to as a role model. Saints can be chosen on a wide variety of criteria, but they should be chosen with care. Some people choose the Patron Saint of a particular place, a Saint who had a particular hobby, job or characteristic, or simply a Saint they admire. Catholics can pray to their Saint for help if they want. 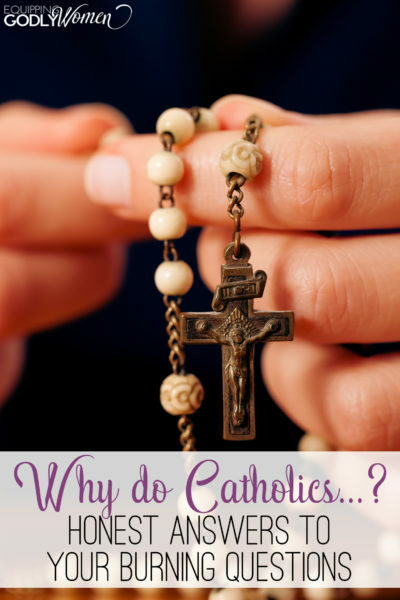 Why do Catholics Use Crucifixes? Crucifixes, like statues and stained glass windows, are used by the Catholic Church to help tell the story of Jesus. Catholic churches use crucifixes instead of empty crosses because it helps bring the message home in a deeper way and because the cross is meaningless without Christ’s death on it. Catholics do realize, of course, that Christ didn’t stay there. The Catholic church requires a crucifix to be visible during Mass. You can also find them in Catholic homes, hospitals and schools, for example. Why Do Catholics Say Scripted Prayers? While Catholics do also pray impromptu prayers off of the top of their heads just like Protestants do, you’ll often also find them reciting scripted prayers such as the Hail Mary, the Our Father, and the Grace Before Meals prayer. My husband’s grandfather even writes up an entire page long prayer for everyone to recite together when we all get together on Easter, Christmas, etc. Why? For one, it is unifying to have all of the people pray the same thing together at the same time (and to know that people all across the world and throughout time have all prayed the same prayer as well). Some prayers simply became repeated often because people liked them and found them helpful. And lastly, having a scripted prayer to pray can be helpful if you are uncomfortable praying and don’t know what to say. For Protestants who are uncomfortable with scripted prayer, it may help to realize that you probably use Scripted prayers more than you realize. For example, signing a great praise and worship song in a Protestant church can actually be a form of scripted prayer as well. And don’t forget the old classic “Now I lay me down to sleep…” that I bet you learned when you were a kid. Catholics believe that baptism removes original sin. To find out why–as well as to learn TONS of facts about baptism you never knew before–be sure to check out my previous series post: Infant Baptism or Believer’s Baptism: Which is Correct? Why Do Catholics Sit, Stand, Kneel? This post gives a good overview of what to do when and why. It’s a lot to remember, but you can usually just watch everyone else and follow along pretty easily. Praying for the dead is a longstanding custom that dates all the way back to the Old Testament Jewish people. Catholics still do it today because they believe it will help Christians who have died make it through Purgatory faster. To find out why and how, be sure to check out my previous series post: What is Purgatory? What are Indulgences? History of the scapular: Scapulars actually started off as large garments monks wore as work aprons. Wearing a scapular was a great honor. Eventually the average Church people began wearing them as well, and they shrunk down to a much smaller size. Why do Catholics wear scapulars: Catholics wear scapulars as an outward sign of their Catholic faith, to represent their faith and to obtain the protection and graces they provide. Scapulars are NOT magic charms and they do not automatically send just anyone to Heaven. However, when faithful Catholics wear them as a sign of their devotion, they do believe it will protect them and impart graces. Non-Catholics can wear scapulars too, although they don’t get all of the graces. Why Do Catholics Use Incense? The Old Testament Jews used incense in their worship, so the practice probably simply carried over. Today, Catholics use incense to symbolize their prayers rising to Heaven, to create the ambiance of Heaven, to symbolize sanctification and purification, and to remind us that Mass transcends the physical building and reaches to Heaven as well. Hopefully this post answered some of your questions. Otherwise–what questions do you still have? What clarifications need to be made? Let me know in the comments below! Enjoyed this post? 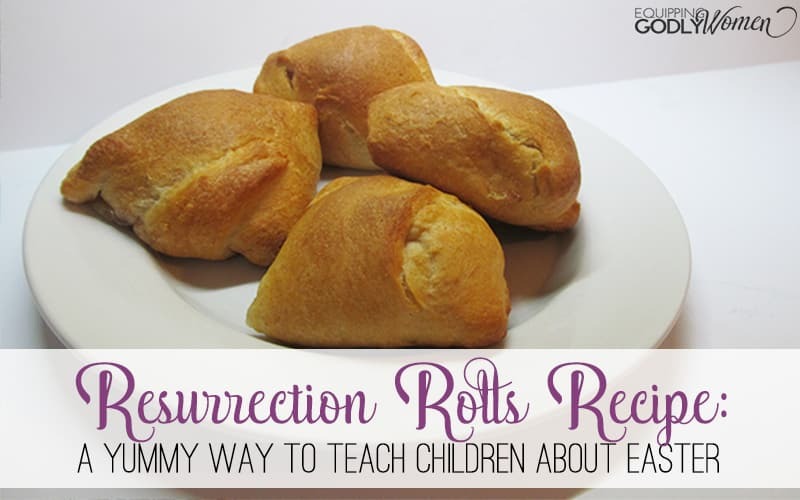 Don’t miss the rest of the posts in the series! Is the Eucharist Really Just a Symbol? What Do Catholics Really Believe About Mary, Saints and Statues? Infant Baptism or Believer’s Baptism? Which is Correct? What is Purgatory? What are Indulgences? I’m not asking you to believe because I say so. Please DON’T take my word for it! The purpose of this series is only to share what I’ve learned on my journey in order to inspire you to begin a journey of your own. 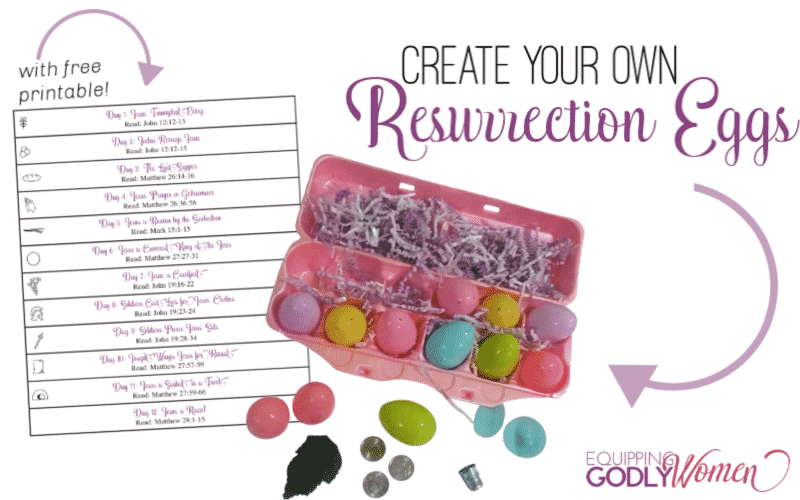 Here are a few helpful resources to get you started. I can’t answer why eggs are permitted, but fish are permitted because the fish is a symbol of Christ. From the miracles of feeding thousands, to early Christians who used the fish as a sign to tell people which way to go to find their “church” in the first century when meeting was punishable by death, to the stickers and magnets we place on cars today. It’s also important to note the official rule is Catholics should abstain from meat on ALL Fridays, not just during Lent. However, the local Bishops’ conference has wide latitude on this. The US Conference of Catholic Bishops has decided abstinence is only required during Lent, while other conferences continue to require it year-round. And although it is not a requirement of them, many American Catholics do still abstain from meat on Fridays throughout the year. I had heard this, and that people are supposed to do something else if they don’t do meat the rest of the Fridays of the year. The rules have changed over the years because this is a “discipline” rather than a “doctrine.” As others have said below, it’s about making a small sacrifice to show repentance for sin and in recognition of what Christ did for us. That’s also why it’s Friday and not any other day of the week (except on Ash Wednesday), and why we don’t count Sundays in the 40 days of Lent (how can we fast in the presence of the Lord?). Ultimately it can be boiled down to, “because the Church says so.” But how often does the “because I said so” argument work for you as a parent? I’ve seen my sisters try it with their children to various degrees of failure. Yes! Awesome post. Adding a bit more to Bryan’s comment, Catholics are supposed to recognize every Friday of the year as a special day of penance in remembrance of the Crucifixion. The USCCB (United States Council of Catholic Bishops) have allowed for a substitute penance on Fridays outside of Lent (extra prayer, fasting from another food, charity work, etc) but the first preference is abstaining from meat. It’s all about making sacrifices out of love for Christ. I apologize for not remembering (so many posts and comments to keep up with this fantastic series), but has the Catholic concept of “redemptive suffering” been discussed yet? That’s where Catholics offer sacrifices or any suffering as a prayer for themselves or others. We believe that Christ can turn our sufferings into graces for ourselves or for others. Thanks for sharing! I will definitely check it out! Thanks for answering some of these questions for me. Great post! Thanks, Starla! Can you think of any others I missed? Well, thanks 🙂 and thanks for taking the time to read and respond. Please tell me if I’m wrong, but it seems like there are so many different Protestant denominations, and even inside them, church is different in almost every other city. I knew Protestants don’t pray Hail Mary but I didn’t know they don’t pray Our Father, especially because it’s scriptural and a direct order from Jesus (Mathew 6:9-13). Not eating meat on Fridays is like a little sacrifice we do to honor Jesus’ sacrifice on Good Friday. Just like you wouldn’t have a feast on your parents’ anniversary of death. Since it’s meant to be a sacrifice and used to exercise spiritual discipline, you shouldn’t stuff yourself with delicious (and expensive) fish like some people do. Mass is not boring if you really know what’s happening, which I’m sure you do after all this great research you did. And how many people in attendance actually know what is happening….? Exactly, it’s not just about us. Actually, it’s about us being with God. Catholics believe Jesus is present during every Mass in Eucharist, and we’re joining Heaven during Mass (this must sound SO weird to non-Christians 😀 ) as it’s described in Book of Revelation. I think part of the reason why Protestant church fell apart into so many different denominations is that they began putting focus on themselves, adapting God for themselves. And while I’m all up for discussions and “because the church says so” is never an answer for me until i research WHY the church says so, I found that unity is extremly important. That’s a good question. I thinks priests should that explain more often so that everyone is aware of why certain parts of the Mass are the way they are and what they represent. The “keeping people awake” comment is super accurate actually, especially in reference to the bells. Back in the middle ages (or perhaps earlier) since the Mass was in Latin and people tended to not always pay attention they would ring the bells to go “hey! The bread is becoming Jesus! Pay attention! Be reverent”. Ok, maybe they didn’t say it quite like that but you get the idea. 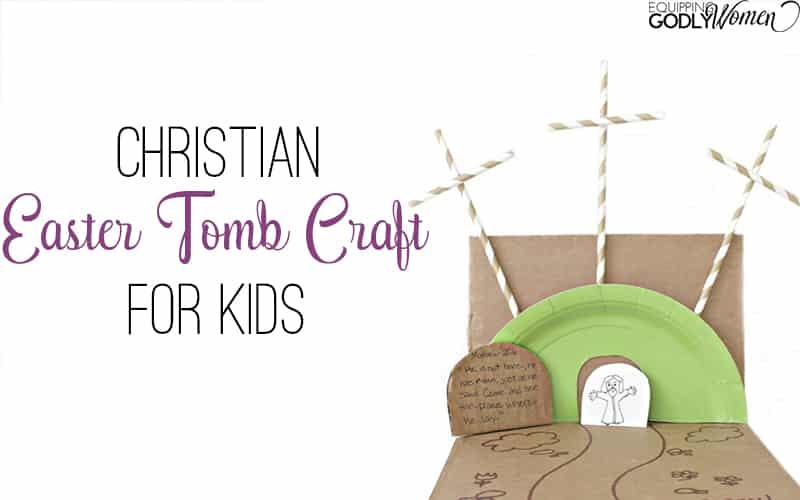 It’s similar to how other traditions in the Catholic faith have some practical roots but also are beautiful spiritual images that we’ve continued. IE- washing hands prior to the consecration started because wine skins were dirty! They HAD to wash their hands. But it now helps to remind us that even those the priest is a priest he is also still a man. When he washes his hands he prays “Lord, wash away my sins. Cleanse me of my inequities”. Great job and welcome to the Catholic family. Actually, we were not allowed meat on every Friday of the year and during lent we could not have meat on Wednesdays and Fridays. We also fasted from Midnight until we attended Mass and received Holy Communion, today it is one hour fasting and if someone is ill they can have something to drink and/or eat. As for the Saints, yes they are our heroes and our friends and we do ask them to pray with and for us as we would ask any or our friends to do so. As for having statues or photos of them, you are correct years ago people could not read or afford a Bible so the stained glass windows told the stories of the Bible. In the 2nd Vatican Council, we gave up a lot to try and please those who kept disagreeing on why we did certain things. Many of us older people missed everything and we are glad many are coming back. Many people will ridicule us about the Saints and photos etc. while they will spend a lot of money to wear sneakers, jackets, shirts of their favorite sports figure. They are their heroes and many want to be like them and think it is all right for them to spend all that money worshiping these people. Yet they constantly knock us for loving our friends and heroes who set great examples of helping people all over the world who were poor, uneducated, ill and lost to drugs etc. We are all called to be saintly or holy people. Will check out more of your postings. Really enjoyed this one. As a much older Catholic I can honestly say I was never taught to dislike a person if they were not the same religion as I was. We did blame the Jewish people for the killing of Christ, but we never persecuted them. Some of my family married Jewish people and we always treated them with kindness and loved them. Thank God today we will say Jesus was killed by some Jewish people and we really do not know who else made up the crowd. Since Jesus walked the Earth, people can be either For-Christ or Anti-Christ. I love the analogy you gave of sports figures! That is so true. I found the same analogy in country songs and the way they sing about the women they love. If people want to accuse anyone of idol worship–I don’t think the Catholic Church needs to be the first place to look. I am the same, Sara. Whenever I walk into a Catholic church, I am home. Best feeling in the world. I posted this a few minutes ago in the comments for the article about Confession, but I’m posting here as well. It’s just one more explanation of why Catholics confess to priests. This is so great with tons of information! My husband grew up Catholic and converted as a teen while I have always been non-denominational. Thanks for sharing! Thank you I love this. I remember going to Catholic church when I was real young. I remember my Mom got excommunicated from the church for attending bible study with people from a non-denominational church. You truly answered A LOT of questions I have had. Officially excommunicated?? I’m almost certain that attending a non-denominational Bible study is NOT an excommunicable offense! Yup just for going to a different church bible study on a weekly basis. My Mom was a Chrisitian and my dad was catholic. He thought that she was going to dance with snakes at a Christian church ha ha. I’d honestly have to ask her if it was an official excommunication but we had to stop going to Catholic school as well since it was associated with the church we went to. Maybe my Dad made something up about her I don’t know because she got the boot haha. Wow, that is crazy!!! I doubt she was officially excommunicated from the entire Catholic church, but I guess I could see that particular church saying “uh, maybe you’d better find somewhere else to attend.” Not that I agree AT ALL, of course. Wow! Crazy! Sounds to me like someone who knew nothing about Canon Law didn’t like what your mom was doing and rather than try to understand it they rushed to judgment. The main point they missed is that you have to be Catholic in order to be excommunicated from the Catholic Church. If she wasn’t Catholic, she wasn’t in communion with the Church so there’s no point to excommunicating her. All you’d be doing is stating something that was already fact – the person is not in communion with the Catholic Church. Also, a Bible study is not normally an excommunicable offense. So even if she were Catholic, it’s not something which carries an automatic excommunication. There would have to be a formal declaration approved by the Church. “you have to be Catholic in order to be excommunicated from the Catholic Church” : That’s a very good point, lol. I’ve been reading your articles and enjoying all of them. I am a cradle Catholic and I’ve been learning things (or at least reminded of things I had forgotten) through your posts and the comments on them, particularly the comments and in-depth discussions between Bryan and Deacon Gregory and others who have commented on the blogs. I love the fact that you’ve dug so deeply into the Catholic faith and Catholic tradition. I have refrained from responding to your other blogs, for the reason that I don’t feel comfortable discussing (or arguing, which, unfortunately, happens all too often) something as important as my Catholic faith online with people I don’t know. I’ve felt like I should leave that to those who are more scholarly than myself, such as Bryan (you know your faith, Bryan!). I don’t know if this is an official teaching, but one thing I have been told by priests (and which makes a lot of sense) about the Catholic tradition of not eating meat on Fridays is this: in the time of Christ and of the early Christians, meat was a meal that most people could not afford, while fish was the poor man’s staple food (many of Christ’s Apostles were poor fishermen). It was, therefore, encouraged, especially for those who were well off, to abstain from eating meat, so they could make an offering by eating a poor man’s meal, thus drawing themselves closer to Christ through the sacrifice of eating a poor and inexpensive meal. For this reason, those who “love” Fridays because they can go out and eat fish and seafood, neither understand nor practice true abstinence. If you “love” fancy seafood, you should not jump at the opportunity to eat it every Friday, because that is not an offering. Instead, those people should eat something simple, like a tuna sandwich or a tuna salad or perhaps, not even eat fish. Peanut butter and jelly is a simple substitute for fish lovers. The point is to sacrifice and, through that offering, to, hopefully, grow closer to Our Lord. Also, just as a note, the Catholic Church, as far as I have ever been taught (and I’ve been raised in a very conservative/traditional Catholic environment and have gone through a conservative Catholic homeschooling correspondence program which uses very old Catholic books, so I’m sure this is the case), the tradition is no meat of any kind, excluding fish/seafood. Chicken is not allowed, nor is any other type of bird meat. Only fish. I hope you continue your journey toward the Catholic faith with as much joy and enthusiasm as you have throughout this blog series. Your enthusiastic exploration of Catholic teaching is an inspiration to Catholics and Protestants alike. I encourage you to continue searching the Catholic faith and, perhaps, to continue this with another series. There is still SO much more for you to explore. One could spend a lifetime studying the Catholic faith and not learn everything about it. It has, after all, existed for 2000 years. 🙂 Good luck on your journey and may God bless you! P.S. – Here are some very good Catholic books I encourage you to read, if you haven’t already done so. I especially recommend the last book. Hey, there is room for EVERYONE in the comments section–whether you know a lot, a little or nothing at all. And I’ve been very, very proud that everyone is keeping it so cordial and not fighting–we’re all just diving it deep and discussing and I LOVE that! Yes, no meat but fish is okay and for some reason eggs are too I’m pretty sure. (It’s meat in my book, but I guess it doesn’t count because it isn’t flesh?) Explanations really vary–I’ve heard several of them. I’ve been impressed with the lack of fighting in these posts, as well. Unfortunately, the comment sections on most blogs don’t stay as nice as this one. I’m glad everyone is being so respectful of everyone else. Fighting gets nowhere, no matter what you’re discussing. I will be looking forward to more series on great stuff from you. I’m sure you’ve got plenty of wonderful ideas and you’re a great writer. Something I heard about fish and eggs on I have had Fridays explained to me this way…it goes back to Noah on the ark… what did they eat? They obviously did not eat the meat on the ark ..
Brittany, this article was interesting and helpful in understanding aspects of Catholic culture with which people like me are unfamiliar. There has already been much discussion in your series on critical differences between Protestantism and Catholicism, so though I as a Protestant have questions about a few items here and there on this post, I’ll refrain from mentioning them at the moment. Instead, I just want to say congratulations on a well-presented series, and whatever decision you have made about Catholicism and will reveal this week, I pray that you and your family are drawn ever closer to Christ this Easter season and this year, for He is our King and Savior. I believe that all of us who are truly His are united under His headship in the presently invisible and universal Church that unites all believers throughout all time. Whatever denomination we belong to, if we are Christ’s, we are all united in a spiritual family through Him. As for your decision, I would, of course, urge you not to leave Protestant branches of the faith, but I would also urge you to pursue what you are convinced to be doctrinally true. I don’t mean in saying this that truth is subjective (it’s not). I mean that many can be attracted to either the Protestant or Catholic branches of the faith simply based on denominational culture, or perceived academic respectability, or a popular preacher or for any number of other reasons. What truly matters, however, is whether the doctrines taught are true, so be sure to either embrace Catholicism or remain Protestant based on which one you think is most accurate doctrinally and which one will help you to most glorify Christ in your life. I’m sure that most of the Catholic commenters on this site would agree with me on this point too. I mostly agree with you DCal, but with some clarification. Catholicism is not a denomination (it never denominated from anything). And the Catholic faith is not a matter of personal preference. If it were, I don’t necessarily think I would be Catholic, since it is a tough faith to follow. Rather, it’s the complete fullness of Christ’s Truth. I hate to see Christians become relativistic in regards to their faith because at a certain point, either Catholicism is True (for all people) or it is one giant lie and I’ve been spending too much time worshipping a piece of bread. So that is why I embrace Catholicism because if I went anywhere else, I would be abandoning Jesus in the Holy Eucharist and saying that I want to do religion my way. Again it truly makes me sad to see Protestants so in love with Christ, but then so reluctant to embrace His fullness in Catholicism. Once you study and see the beauty of Catholicism, how can you (meaning in general) resist it? Tl;dr – Catholicism is ether True or its evil and should be avoided at all costs. But there is no way it can be true for some people, but not for others. Margo, thank you for your reply. I think you misunderstood my statement. As I noted, I don’t believe truth is subjective, and I fully agree that Catholicism can’t be true for some people and not true for others. When I spoke of following what one believes to be true, I meant that when looking at different churches, there can be a temptation to pursue something other than truth. In the Protestant world, for instance, it can be tempting to follow a well-spoken preacher or to become part of a friendly congregation without considering whether what they say is true. In the Catholic world, it can become easy to be impressed with the scope of the Catholic church without considering whether one believes the doctrines that the Catholic church teaches. I was merely saying that it is important to seek to follow truth, not trappings. I’m Protestant because I believe that is closer to the truth; you’re Catholic because you believe that is closer to the truth. One of us is right, and one of us is wrong. We can pray for God’s mercy where we err and for Him to lead us to the truth if we are in error. However, if I were to switch to Catholicism, I think you would prefer me to become Catholic if I believed it was true, not because I believe it to be impressive. If you were to switch to Protestantism, I would prefer you to become Protestant not because you simply liked a minister’s preaching style, but because you believed Protestant teachings. In circumstances like these, I want us all to pursue Christ and His truth above everything else and wherever that leads, and I would hope you would want the same. That’s what I was getting at when I said most of the Catholic commenters would agree with my statement that pursuing truth is of critical importance when choosing which church to attend. Like you, I am in complete disagreement with postmodern relativism. I don’t buy into the “it’s either True or it’s evil” debate. It depends on which part is off. If the Eucharist isn’t really Christ–that’s a huge deal. But if Jesus never meant for Catholics to light candles for their prayer intentions or to make the sign of the cross (for example) — those are only minor details that would not negate the entire religion. Honestly, I don’t believe that ANY branch of Christianity is 100% without error. We are all human and I’m sure we missed a detail somewhere. Not that there isn’t absolute truth–there is–but who am I to say what it is? Not saying the error is huge. Just that if there is a small, inconsequential error somewhere–Jesus wouldn’t bother to come back to correct such a small thing. These are all fascinating bits of information about the Catholics religion. I am sure many people will enjoy learning these bits of facts. I have always been curious myself. Thank you for sharing your knowledge with us. Yes! That’s one of MANY explanations I’ve read/heard. Not sure if there is one “official” reason since there are so many valid ideas on the matter! My mom told me that the bells are rung when the priest holds up the Host to sanctify it and they ring the bells so in a crowded or very large church everyone knows when it is that moment. That this is when the Host becomes The Body Of Christ. I’m not sure how she knew this or if it is true but I always loved that. I’ve heard of it, but I haven’t looked into it sufficiently enough. Honestly, I had no idea that things like this even existed until I heard them mentioned briefly in RCIA. All of the Catholics were like “Yep, old news. Been there done that.” But I had no idea! why are the statues of Mary in the yard either in a half shell or a standing tub? I’m not sure about the ‘tub’ (may just be protecting the bottom of the statue, or holding it straight?? ), but the shell I believe you are referring to might represent a grotto, or “heavenly light” (like a halo in a painting). I recently read “Catholicism for Dummies” and would highly recommend it to “cradle Catholics” and non-Catholics alike, as a source of understanding of our ancient customs and beliefs. Thank you Brittany for a well done post! It was succinct and non-confrontational and very informative. I’m so happy that God is leading you down this path, and I just want to encourage you! My husband is also becoming Catholic – he’s in his 3rd month of RCIA – and I’ve been learning so much from him. As a cradle Catholic, I love being able to talk through all the facets of the Catholic faith with him and both of us learn new things. Thanks for being obedient to God – I’m sure your story and your posts are helping many! Thanks! I love to talk about this sort of thing too–it’s so important to know not only what you believe, but what others believe too, to clear up all the misconceptions and to make sure you’re on the right path! Oh also, the priest are intended to be for Catholics what the scapegoats the Jews used. Everyone feels better when they share their sin. It makes it easy to let go. Thanks Kimberly! I have actually been through RCIA and have learned a lot, but you’re right–so much to learn! So still learning and sharing as I do! Wow, you’ve got a bunch of comments on this one. 🙂 I don’t have much to add, I just wanted to jump in here and say how much I appreciate your taking on this topic. It’s really eye-opening to me as a protestant. I love my Catholic brothers and sisters–because I do believe we’re all one in Christ–but I don’t always understand them. I wanted to touch base with you about the bells. When Mass was first being celebrated it was for the “masses”, there were no microphones back then and also very difficult for people to see the priest. They would ring the bells to signal to the masses that the miracle has happened and the host and wine are now divine. There is also a lot of great insights in the book “Why Do Catholics Do That?” by Kevin Johnson. It’s a great read. Hello! I respectfully have to disagree with a lot of what has been said. I use the King James Bible. There is no copyright as with all other bibles. It is recognized as the true word of God. I can freely copy my KJV without permission, but with ALL other bibles you have to get written permission from the publisher because they have changed the KJV. Usually Thomas Nelson or Zondervan. With many things you practice , there is not Scripture to back it up. For example, the rosary, eating meat on Fridays, the sign of the cross, and Purgatory. Whatever is in my KJV is what I practice and follow because it is God’s word not mans word or opinion.The Bible reads not to change a jot or tittle. Just wanted to share and give you a vision of what others practice. Thank you for taking the time to read. Hi, Krista, thanks for your thoughts! Also, the other translations haven’t been translated (and changed) from the KJV. The creators of those Bibles go back to the *original* manuscripts (or as far as they can get to the originals, which is surprisingly realllllly early) and translate from them. The KJV is a translation itself, just like the others. It is not the original text, so unfortunately, some meaning will always be lost in any English Bible. You are correct, though, that not all the things the Catholic Church teaches are in the Bible. This is not because they are pretending things are in the Bible that aren’t. It is because they base their beliefs on all of the beliefs of Jesus and the apostles – some of which were written down (in the Bible), and some of which did exist but simply were not written down (it was an oral culture back then, so it was normal for people to teach orally since most people couldn’t read). For more on these issues, I would highly encourage you to read and consider another article I wrote in this series: Who Has the Ultimate Authority? A Biblical Look at Sola Scriptura. The things I share in this post were a major turning point in my faith as I realized that — when I read the Bible — it did NOT say what I thought it did! For the record, I’m not actually Catholic. Just a Bible-believing Christian committed to digging in deep and figuring out what the Bible truly has to say, and then discussing these matters with other Christians who also want to grow in faith and get as close to the one true Truth as possible. We are called to fast during Lent, it is a tradition that was changed later, but the true reason is a sacrifice in remember Anne of what Christ did for us. If you want to really understand the kneeling in mass, pick up a break down of a Latin mass…it explains it far better than anywhere else. 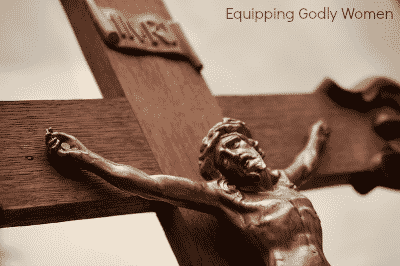 And the crucifix…without it we have nothing. Without that death there would be no resurrection. Without that there is no Christianity. We see it as a beautiful and painful reminder of what He gave up for us. I’m confused, what are you professing? Are you professing to be Catholic or a Follower of Jesus Christ ?! I’m not personally Catholic, no, but those two are not mutually exclusive. Catholic is a type of Christian. A type that also follows Jesus Christ — they simply have a different understanding of what that looks like (as do all 30,000 or so Protestant denominations).